Toraja people are one of native people in Indonesian Tribes that lives in South Sulawesi, Indonesia. Most of the ethnic descendants are living in Tana Toraja or Toraja Land in the middle of Sulawesi island, about 300 km north of Makassar, the capital city of South Sulawesi province. 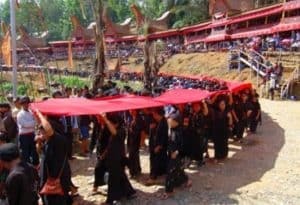 People of Toraja adheres to animism, which sees that ethnic other than humans such as animals, plants, and other objects that live and die have their own spiritual essence. Therefore the Torajan have funeral rites that is quite complicated to do at worldwide level. The funeral ceremony is basically a manifestation of respect and reminder of the deceased who had proceeded toward another world. Various traditions are formed to make that happen. No exception, for ethnic Toraja . They have funeral rites that are very strange and quite scary but also attractive to many people. The burial ceremonies in Tana Toraja are well known worldwide and invite many tourists each year to see it. In the local language the funeral is called Rambu Solo. This ceremony has many meanings so many tourists are interested to witness the funeral ritual. Toraja burial rituals are usually performed months or even years after someone’s death. This is because there is a huge cost for a ceremony. A funeral can cost hundreds of millions to billions of rupiah. Therefore, the family members of the deceased need to raise a considerable amount of funds for months. Meanwhile, this large cost is due to the Solo Rambu is not an ordinary funeral ritual. In this funeral ceremony a lot of things that become the requirement and supporters for the ceremony can take place full of meaning. Sacrificial animals is one of the mandatory requirements in the implementation of Rambu Solo. The sacrificial animals used are usually buffaloes and pigs. In Toraja society tradition, buffalo is considered as a sacred animal. Therefore, in the Rambu Solo ceremony, buffalo is a mandatory aspect to be provided. 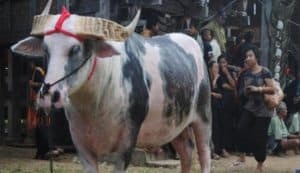 On the other hand, in Toraja society, buffaloes are animals that are considered capable of delivering the souls of the dead to Puya or the place where the soul of the deceased is located. The more buffalo prepared in a single ceremony, the public believes that the soul of the deceased will quickly reach Puya. The buffalo used in the Rambu Solo ceremony is not an ordinary buffalo. The buffalo that will be used as sacrificial animals in the ceremony of Rambu Solo is Tedong Bonga Belang derived from Bubalus bubalis or commonly known as mud buffalo. Characteristic of this buffalo is its skin is white spot like albino. One buffalo of this type can cost 20-50 million rupiah. And if the buffalo has a special quality, the price can reach about 600 million rupiah. For the amount of buffalo that must be provided in one Solo Rambu celebration depends on the social strata of the family. The higher the social strata of a family, the more buffaloes are provided as sacrificial animals. For families with middle social strata, usually buffalo provided as much as 8-10 and added with pigs as much as 30-50. As for the families from the higher social strata, the buffalo that they provide will be around 25-150 and added with tens to hundreds of pigs. 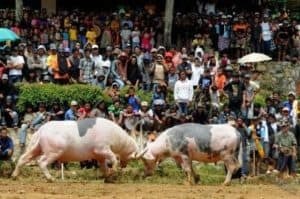 So it is not surprising if this Rambu Solo ceremony costs billions of rupiah because most of the expenditure is used to buy this sacrificial animal. The buffaloes used as sacrifices at the Rambu Solo ceremony will be paraded around the village as a form of respect for the animals. The event is done from the morning and in the afternoon there will be a buffalo fight. After the event ended, the buffalo will be slaughtered. The Buffalo meat then will be distributed to all visitors of this funeral ceremony in accordance with the position of visitors within the community. In addition the spirit of the deceased is also entitled to a portion of meat, known locally as Aluk Todolo. The slaughtered buffalos head will be returned to a place known as puya and the horn will be placed in front of the deceased’s family house. The more buffalo horns are placed in front of the house, the higher the social status of the deceased person. Other requirements of Tana Toraja Death Rituals that must be prepared in the Rambu Solo ceremony are accessories. For example, the coffin is usually decorated with custom fabrics, as well as ropes and accessories of gold and silver. In addition, inside the coffin will also be placed various items as a “travel provision” to Puya. The items are clothing, a variety of jewelry, and some money. Not only the belonging of the corpse, belonging of family members are also entrusted to the corpses who have just died. After passing the Rambu Solo ceremony, the body will be paraded and escorted to the cemetery. The body of the deceased will not be buried until the 11th day of the ceremony. The grave is also not the grave on the land in general but the corpse will be placed in the cave on the cliff. 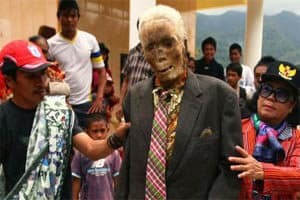 The Toraja people believe that the spirits of the dead will continue to be around the village until the funeral ceremony is completed, and then the spirit will go towards the land of souls. At the time of parading the corpse to the cemetery, the public will spread a long red cloth with the coffin at the very back. Not only the family of the deceased, all the villagers are also walk to deliver the body to go to the funeral. 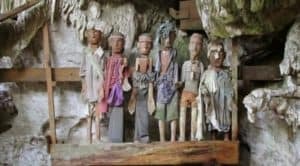 Another unique thing that can be found in this funeral is a wooden sculpture that resembles a person called tau-tau. The Tau-tau statue is carved to depict the deceased person and placed on the grave balcony to keep his remaining family. Meanwhile, this basket is very beautiful with a decoration of geometrical shapes. However, over time this wood will become rotten so that the bones of the corpse will be visible from the outside. In addition to the two grave forms above, there is also a burial ground in Tana Toraja that is “Baby Trees”. There is a tree that is used as a grave for infants of Toraja tribe that still has not grown teeth. When the baby dies, the baby will be wrapped in a cloth and placed into a hollowed-out tree trunk and then covered with a palm fiber door. Local people believe that when the tree is begins to heal; the child’s essence will be one with the tree. To note also is that in one tree there will be hundreds of baby corpses placed there. Not only stop with a big funeral ceremony, every year Torajans also have other rituals that is called Ma’Nene. Ma’Nene is the ceremony of cleaning corpses. This event is held every August every year. At the time this ritual is performed, the corpse of the deceased will be exhumed for cleaning, after which it will be groomed and dressed in new clothes. Each coffin that has been damaged will also be repaired or replaced. These mummies will then be paraded around the village following a path of straight lines. The myth in Toraja said that there is a line that is connected to the Hyang, a spiritual entity with spiritual power. As this entity only move in straight lines, the soul of the deceased body must follow the path of Hyang. According to the belief of the Torajan people, the soul of the deceased must be returned to the village from which he came. So if someone dies on a journey, that person’s family must go to where the person died and accompany the soul of the person back home by walking with them to the village. 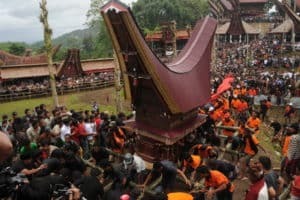 Those are complete explanation of Tana Toraja Death Rituals ceremony.